A sculpture by Barbara Foster marks the 10th anniversary of Prairie Grove, a collection of trees planted at Illinois State University’s Horticulture Center. Trees mark the passage of time differently than the humans moving past them. In terms of the life of a tree, 10 years may constitute only a moment. For the humans who plant them, however, it is a time to celebrate. Children and Elders Forest members with the Prairie Grove 10-year anniversary sculpture. 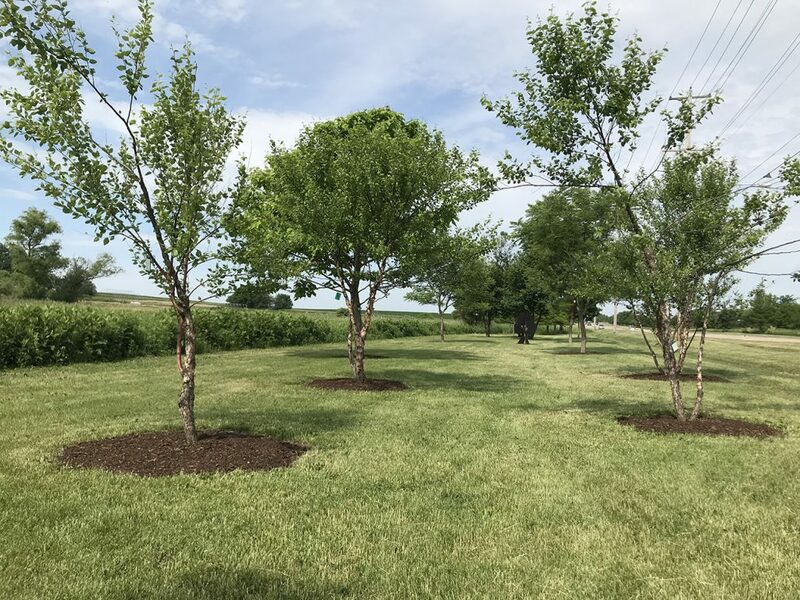 This year marks the 10th anniversary of Prairie Grove, a collection of trees planted at Illinois State University’s Horticulture Center through the community organization Children and Elders Forest (CEF). “Prairie Grove is a perfect example of a great partnership between the Center and the community,” said Jessica Chambers, director of the Horticulture Center. Looking up at the leaves of a newer Kentucky Coffeetree in the grove, she made a note to ask a student worker to give the tree another round of watering. “This one is looking a bit thirsty,” she said. Nestled between a stretch of restored prairie and the traffic zipping by on Raab Road, Prairie Grove is one of the smaller of CEF’s nine local groves, which feature more than 600 trees planted by community members around Bloomington-Normal. First dedicated on a windy day in November of 2008, the grove is now home to 29 trees representing 11 species. A long view of some of the trees growing in Prairie Grove. All of the trees in Prairie Grove are intentionally planted generously apart, and stretch into the air. The spacious design was part of stage one of the grove. Stage two would add a collection of “understory” trees and shrubs that will live under the canopy of the larger trees. “We would look to add trees like dogwoods that will not only add to the look of the grove, but can also dampen the noise from the road,” said Chambers, who added she hopes for a “relaxed, park-like” feel for the grove. Chambers walked toward the middle of the grove, where a new sculpture bears the outline of a tree surrounding a budding leaf. 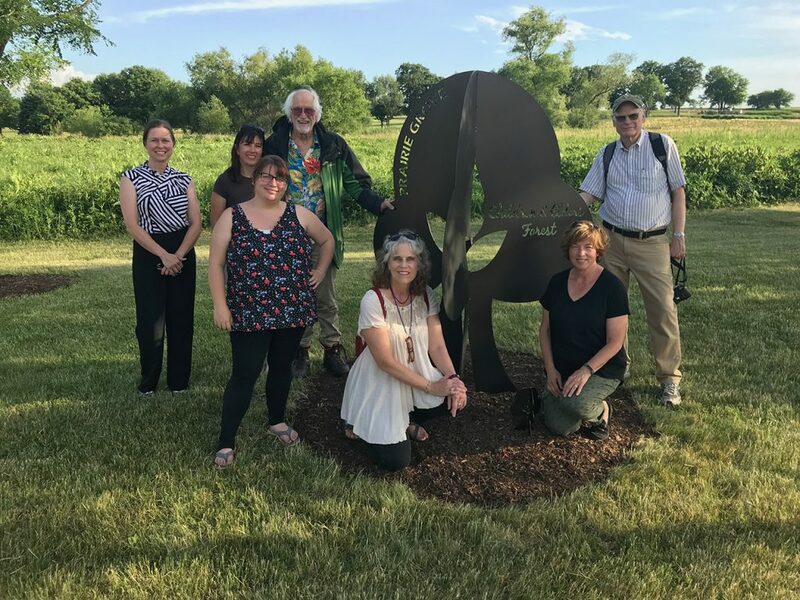 Created by metal-works artist Barbara Foster of Rockford, the sculpture was dedicated this summer to commemorate the decade-long partnership of the Center and CEF. “We were looking for a creative way to celebrate our collaboration that honors so many,” said Chambers. 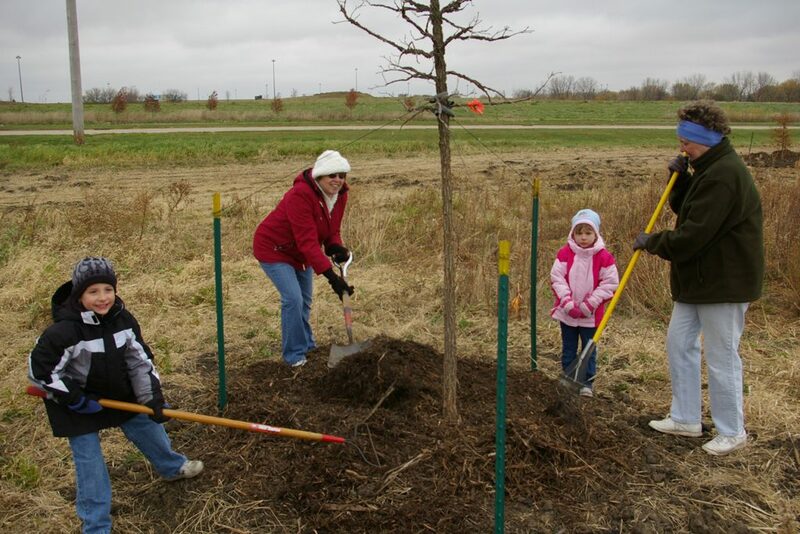 Members of the Children and Elders Forest spread mulch around newly planted trees in Prairie Grove in 2008. Longtime CEF member Professor Emeritus Michael Sublett, who recently retired from Illinois State’s Department of Geography, Geology, and the Environment after 45 years of teaching, remembered planting day for the first trees in Prairie Grove in 2008. “It was a very wet year, but we had some people determined to get the trees sponsors chose into the ground,” he said.